All your 365 licensing in one easy to use interface, backed by our complimentary value-adds and fanatical support. A self-service domain portal for the easy management of your zones, resource records and subdomains. State-of-the-art web hosting utilising HTTP/2 defaults and modern, open-source server software. Brand your outbound email from any device with standardised signatures and clickable banners. Browse the Office 365 support center in order to solve some common 365 problems and frequently asked questions. Log a support request with Databias or browse our comprehensive knowledge base by topic or keyword. We follow tech closely so you don't have to. Read about the latest cloud and licensing news on our blog. We've been around for over 10 years so are more than qualified to manage your company's email. Learn more about us. Buy Office 365 licenses with a simple, user-friendly interface. Microsoft Exchange 365 email combined with locally hosted open source POP mailboxes - a hybrid solution for the cost conscious African business. Our control panel is faster and more intuitive than the 365 admin interface, giving you ultimate control over your licensing. With your needs in mind we've built a single interface for all your 365 licensing. Manage users and subscriptions and minimise your monthly 365 expenditure by reducing unused and partially used licensing. With pricing that rivals Microsoft's own retail cost there is little reason to choose any other solution. We offer a free migration service to new customers migrating from on-premise or hosted Exchanges. Already using Exchange in a on-premise, hosted or 365 configuration? We're experts at migrating mailboxes with no loss of data and zero downtime. Our engineers go the extra mile to ensure you minimse your licensing cost and maintain a happy and productive email environment. In addition to Microsoft's own Exchange Online Protection, Databias offers added spam and virus protection for free with all 365 email licenses. You can always add additional Microsoft filtering in the form of Office 365 Advanced Threat Detection, but you probably won't need it. We've spent years developing an industry leading control panel so that you can be in control of your organisation's email at all times. Licensing, domains, email, billing and support all in a secure, easy to use interface. 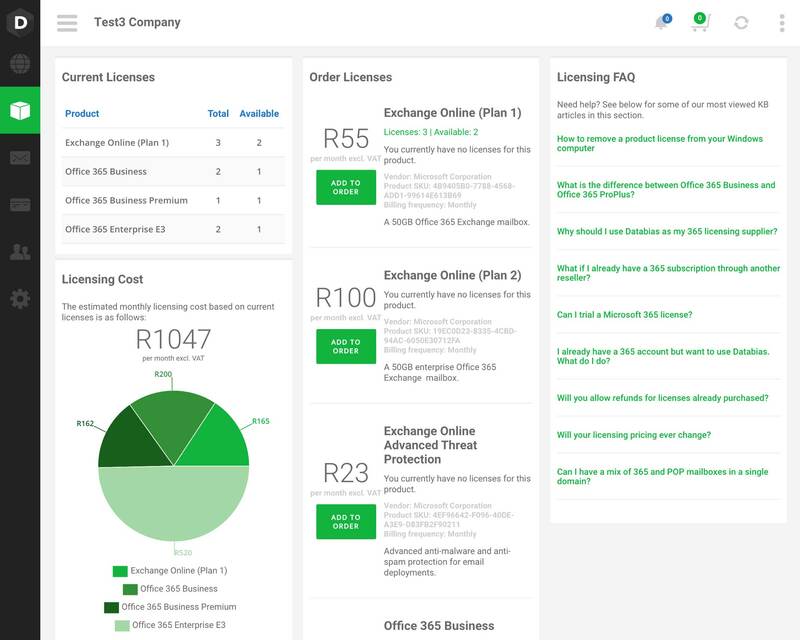 Along with being perhaps the cheapest Office 365 licensing available in South Africa, centralised billing and fanatical support, Databias offers all customers an easy to use web interface so you can manage your own Microsoft licensing from anywhere, anytime. Microsoft licensing can be a little daunting to understand and new, targeted offers can significantly reduce your monthly costs. Not sure what licensing is best for you? Drop us a line via email, phone or live chat and we'll figure it out together. Don't worry about making the wrong choice; you can instantly upgrade / downgrade your mailboxes and software at any time - just another good reason to choose Databias as your Microsoft Cloud Services Provider. These options constitute our most popular 365 mailbox subscriptions. You can at any time increase or decrease the amount of any type of license using our control panel. Mailbox types can be mixed in almost any configuration. The below licensing (besides 365 E3) is for organisations with 300 or fewer mailboxes; for larger installations or enterprise functionality please contact us. Mircosoft spam, virus and threat protection. A 50GB mailbox, Office Online, HD video conferencing, 1 TB storage. An enterprise license, full software and all the extras. These options constitute other 365 monthly subscriptions. You can increase or decrease the amount of any type of subscription using our control panel. The below licensing (besides 365 E3) is for organisations with 300 or fewer mailboxes; for larger installations or enterprise functionality please contact us. Access internal sites, documents, and other information from anywhere. Upgrade Windows 10 Pro to Windows 10 Enterprise. Project management cloud access for project members. Still not sure? Don't stress. We're here to help and have specialised in 365 licensing for over 3 years. Already have 365 licenses that you want to consolidate? We can help make you you are not over-licensed and can make sure you save money by choosing the right subscription for your needs. We know how confusing Microsoft licensing can be but if you are still uncertain about what you need then drop us a line and we'll work it out together. Already using on-premise or hosted Exchange? We provide a free migration service to new customers. What is the most cost-effective way to dynamically communicate in a professional and yet personal manner with customers, suppliers and your social network? The answer is simple - Email! Consider how many hundreds of emails you and your collective colleagues send each day - then consider the potential. Your email signature - a powerful, low-cost and high-return marketing tool. Consider that an employee on an average sends out 40 emails every day to either to a company’s customers, prospects, partners or investors. If there are 20 employees who are active on their email for 250 business days, it amounts to 200,000 annual sends. Now consider the brand visibility you could ensure through a good email branding campaign with well designed signatures and banners. It is easy with Databias and here are some guidelines to consider when building your campaign. Databias is a Tier 1 Microsoft Cloud Solutions Provider, a certified Silver Microsoft Partner since 2010 and an accredited ZACR domains registrar. © Databias 2019. All rights reserved.